The cellular altar object is designed as a novel concept for the retable of the gothic church St. Laurentius in Altmühldorf in Bavaria. Based on prior research with 3D printed light-weight structures, the cellular concept embodies the philosophy and logic of the church’s gothic architecture and aims to contribute to the dialogue on how the development of architectural design can be informed by technological advancements like 3D-Printing and Computational Design. Architects have always been motivated to use design principles of nature to advance form-finding methods. 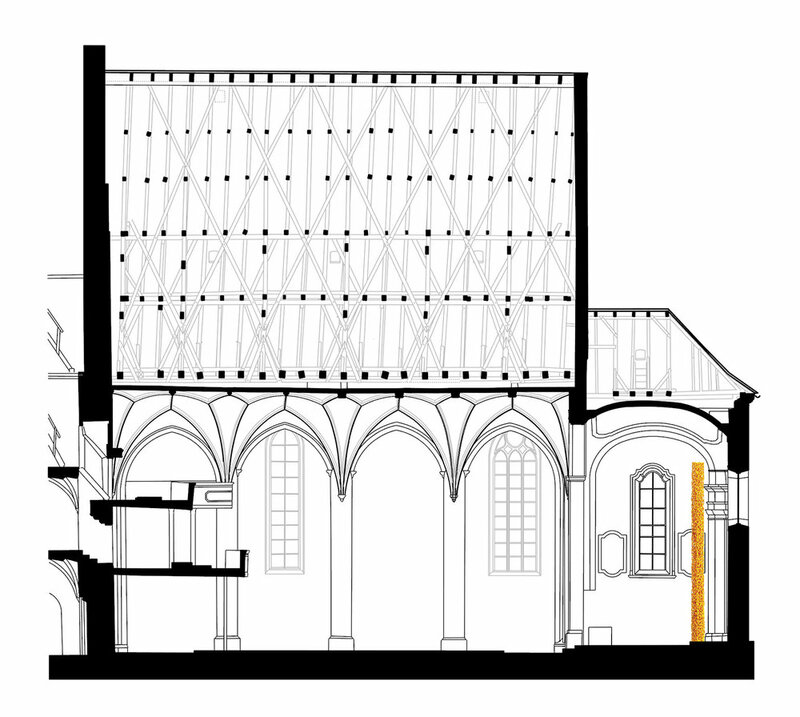 However, limited by solely pressure-based building element systems, the results of the form-finding methods of gothic architecture (catenary model) were geometrically simple forms, like the pointed arch and the ripped vault. The aesthetic of gothic architecture consists then of the hierarchical combination of these geometrically simple elements and ornamental structures. In other words, the internal structure and external form are separated into discrete parts. This is evident because gothic architecture, imagined without the ornament, would keep its structural integrity. In opposition to that, cellular structures e.x. in bone tissue are highly complex geometries without hierarchical separation, but nevertheless, structurally high differentiated. Today, the motivation of architects to learn from nature remains unchanged, but in place of hammer and chisel, however, computational design and robotic manufacturing bring the form-finding - through simulation and high resolution - to the next level. Yielded from the algorithm, in this case of the growth of bone tissue, the underlying design and construction principle does not need to be geometrically simplified, but structures can be generated that embody this very principle. With this approach, it’s possible to develop novel architectural concepts that intertwine load-bearing and ornamental properties and thus form an inseparable unity of visual and constructive aesthetics. One result of this approach is the unique design for this altar screen, that not only impresses with its size of 8 m height and 2,5 m width but foremost with its high stability despite its extreme filigree structure. In fact, FEM Analysis shows that, through its social-democratic structural system, the altar object, even with the removal of 30% of its rod elements, remains structurally resilient. Despite its contrasting novel appearance and the use of vastly different technologies, the sculpture and the church’s gothic architecture share the same philosophy and logic. It’s through this profound conceptual dialogue of research and architecture, that the sculpture integrates itself naturally. Ultimately the altar screen is additively manufactured with Selective Laser Sintering (SLS), that fuses Nylon (PA 12) to 60 building blocks. These are coated with aluminium bronze via Wire Arc Spraying and gold colour via Metal Spray Coating to give it it’s final matt reflective finish. For future projects, Wire Arc Welding is a viable manufacturing alternative as only the structure is printed without the need for support material.